I visited neighbors at the chicken barn in the morning and then after lunch I donated plasma. It was a mix of rain and freezing rain for the day, temperature around the zero mark. It is down to -2 with snow forecast for the night. 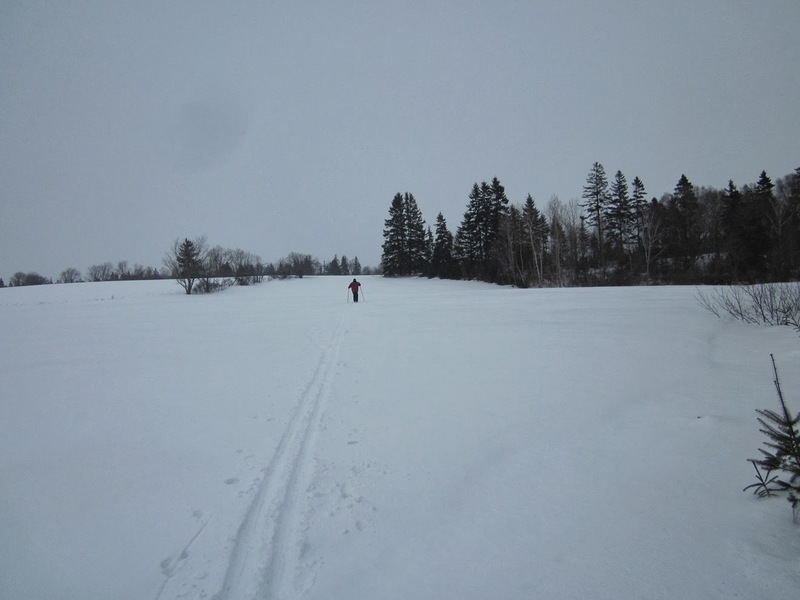 There was light cold rain at +1 when I was out on the snowshoes today. 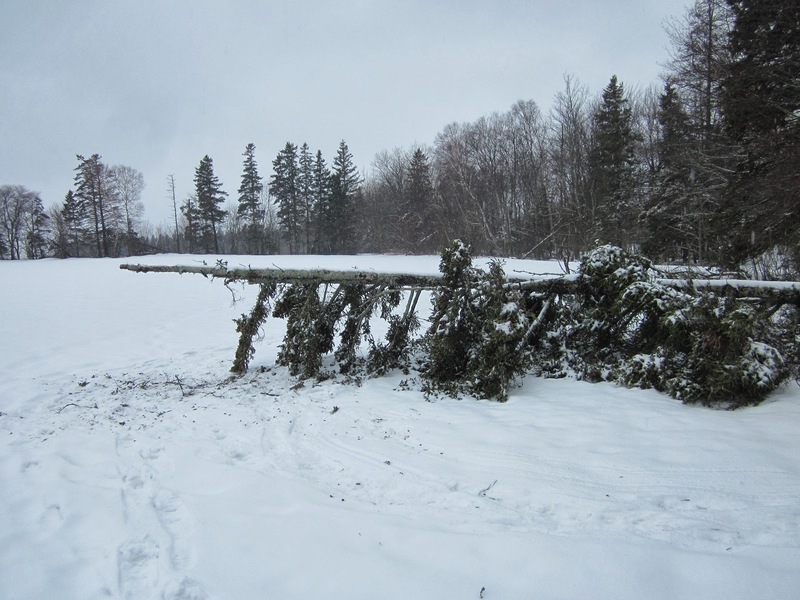 I went as far as the business park and then stop at the site of this tree that was blown down on Wednesday. I took my folding camp saw with me and spend a few minutes on cleaning up the tree. As I post this the rain has changed to freezing rain. I was out for 45 minutes and my jacket was wet though. Hi Donna, yes I think that would be great idea, there is 400 km (250 miles) of trail on old railbed and the grade never exceeds 2%. The surface of the trail is hard packed fine gravel which makes for good riding. 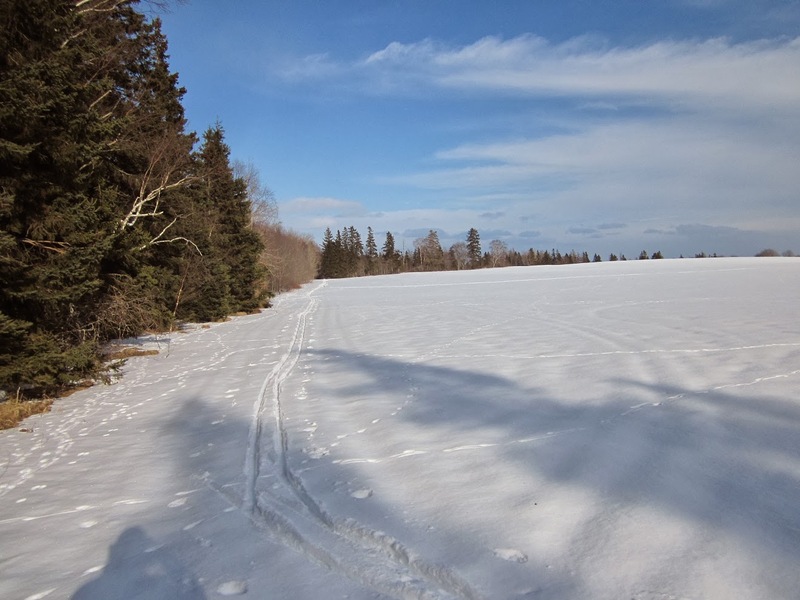 The trail goes though many small towns and villages, farm field, wooded areas and some shoreline. 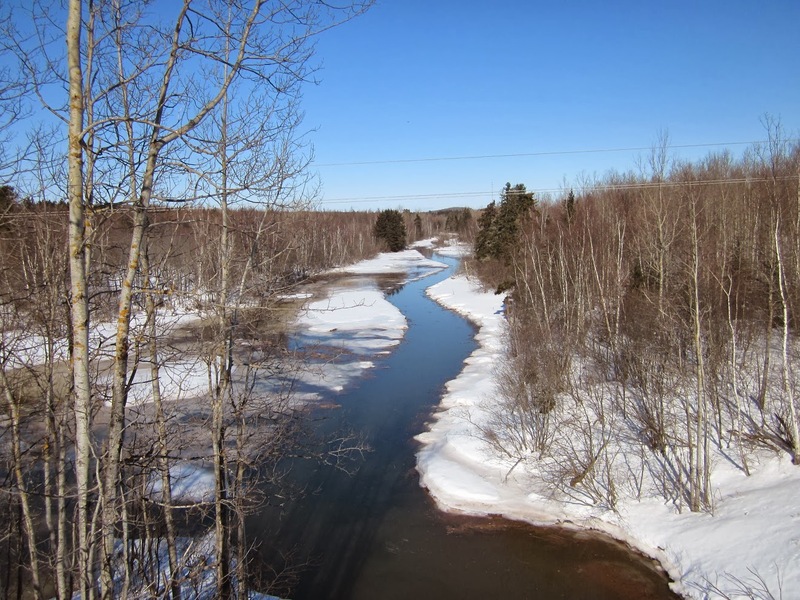 If you click on the Island Trails link you will find more information on the Confederation trail which is the name of the trail I cycle on. 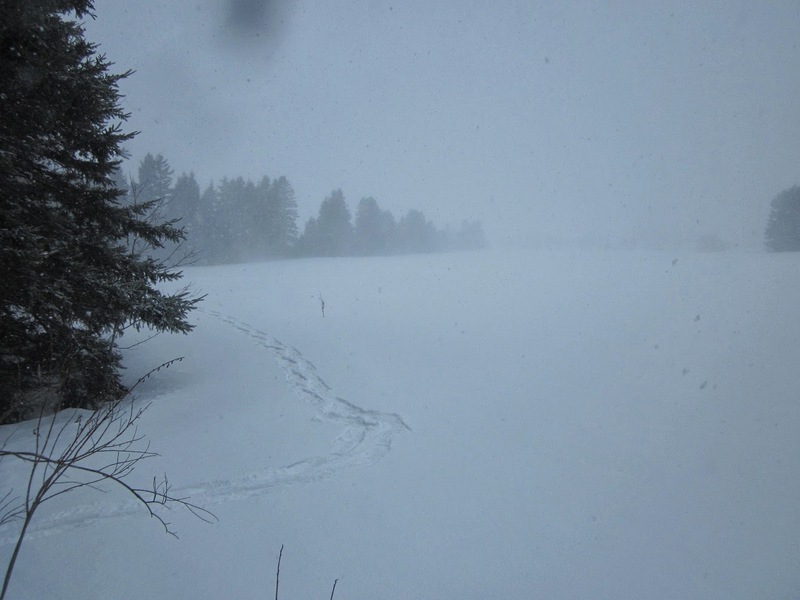 About 4:00 I went out on the snowshoes and walked as far as the business park. 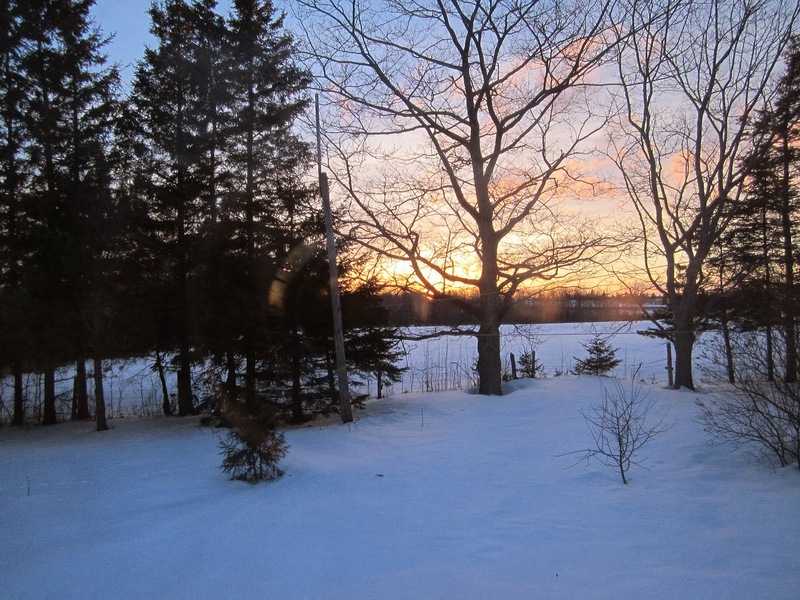 Because of the rain last night and the sun at +7 today the snow has settled a lot. 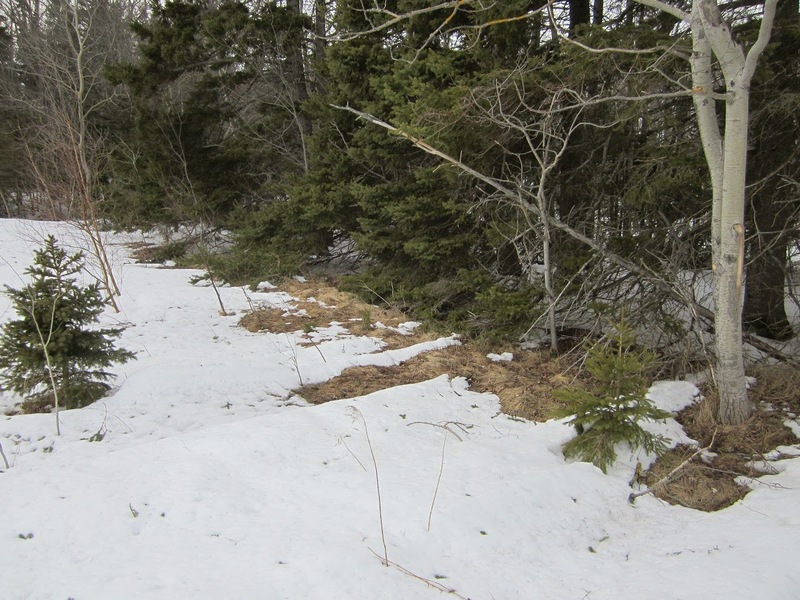 There is some bare ground showing on the south side of the woods. 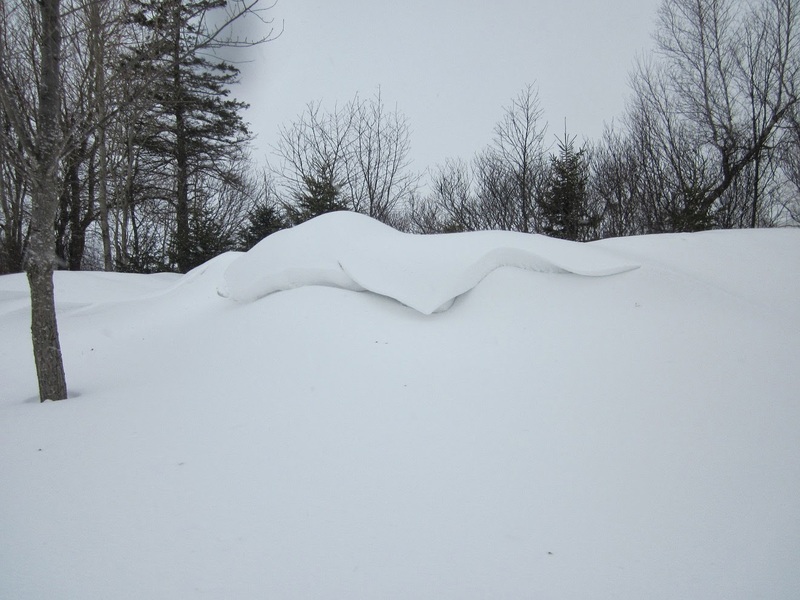 I was out on the snowshoes for a bout 45 minutes, a bit of a eyebrow on this snow drift. 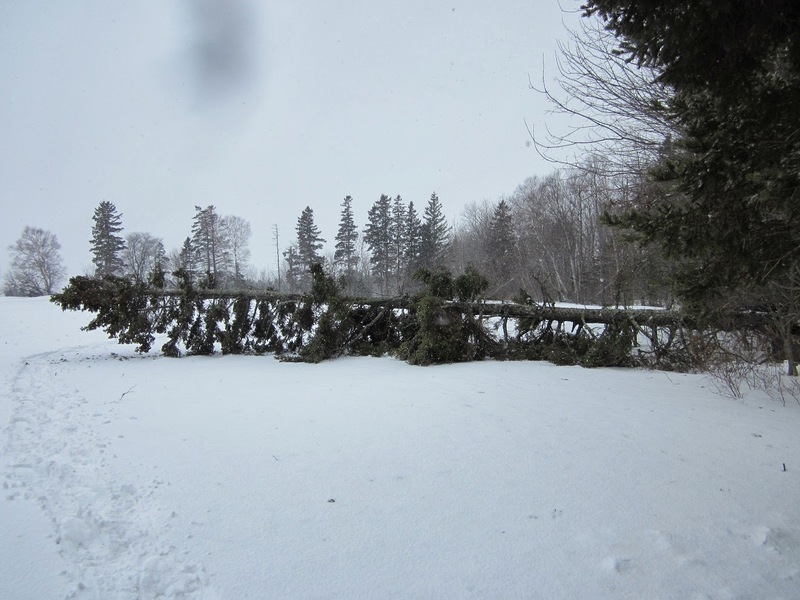 The wind was too much for this spruce tree. 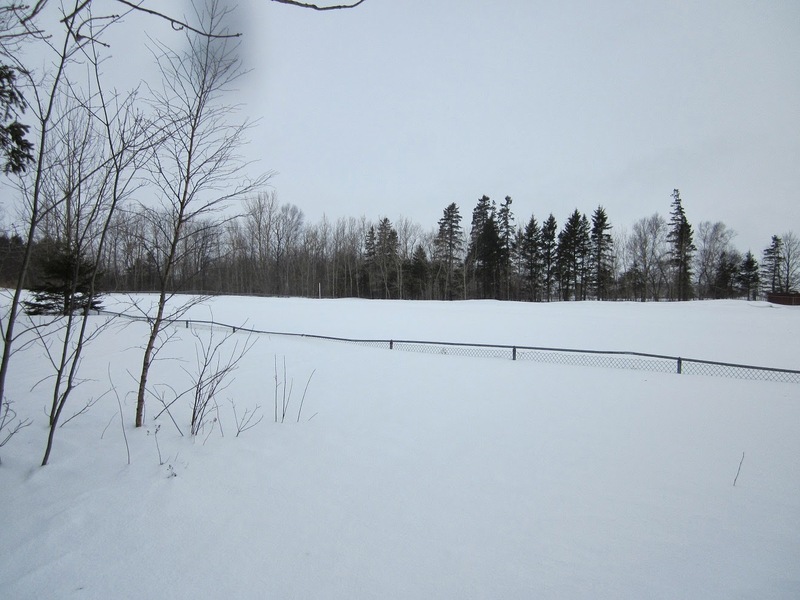 The snow is almost over the ballfield fence. There was a light snow at zero when I was out, calling for rain this evening. 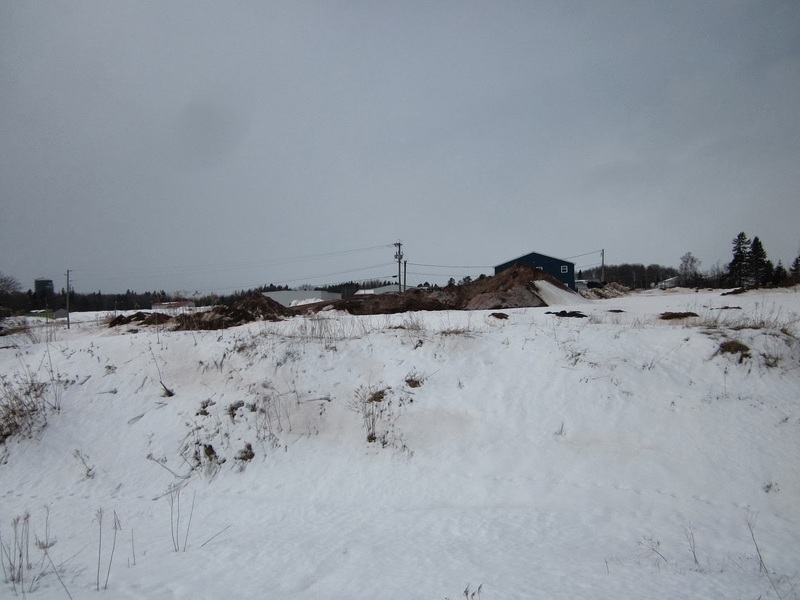 Lots of digging out to do today, the wind was still gusting to 75 km/h so lots of drifting. This was after using the blower three times today but by 5:00 the wind is starting to die down. Along the hedge row of the ball field, I am guessing these drifts are 3 meters deep. We only lost our power for a few minutes though the night, but in Hampshire my brother says they were without power for 22 hours. 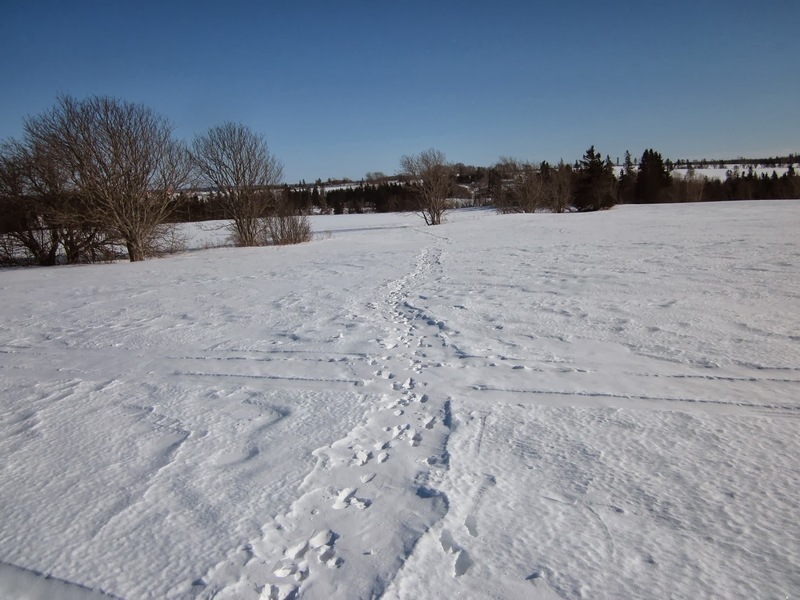 It was back to the snowshoes today, I was out for a hour and travelled the middle loop to the Business park. 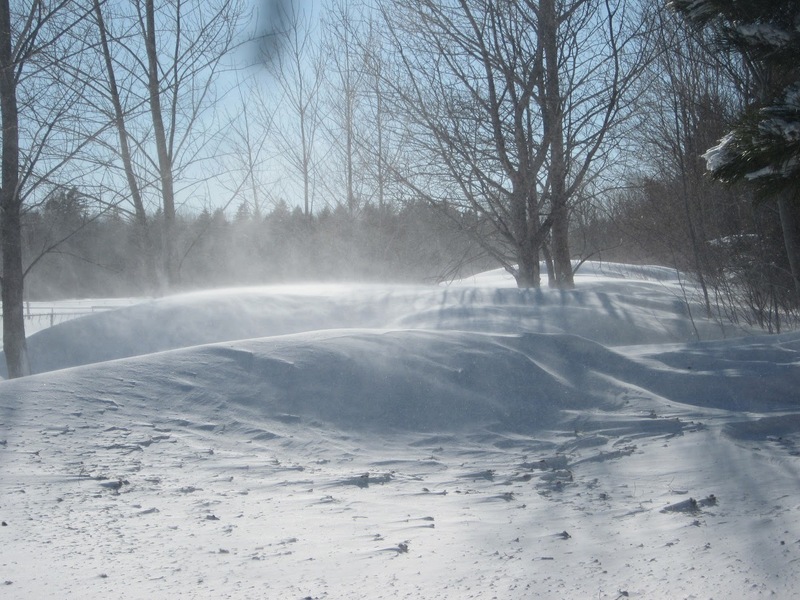 It was snowing with the wind gusting to 70 km/h at -5. The whole island is closed, IE the schools and government offices. 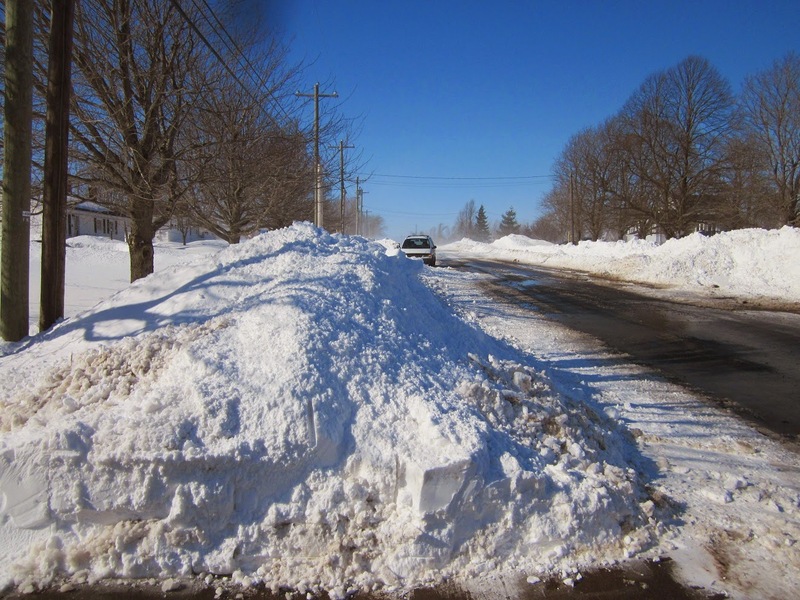 I was looking towards the house across the street but not a sign of it with the drifting snow. 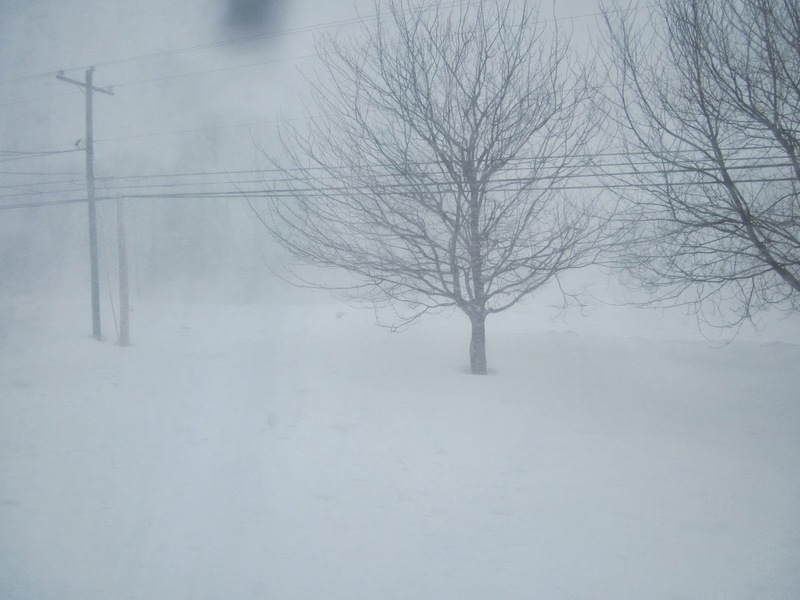 Forecast is for up to 30 cm of snow and winds up to 110 km/h around midnight. 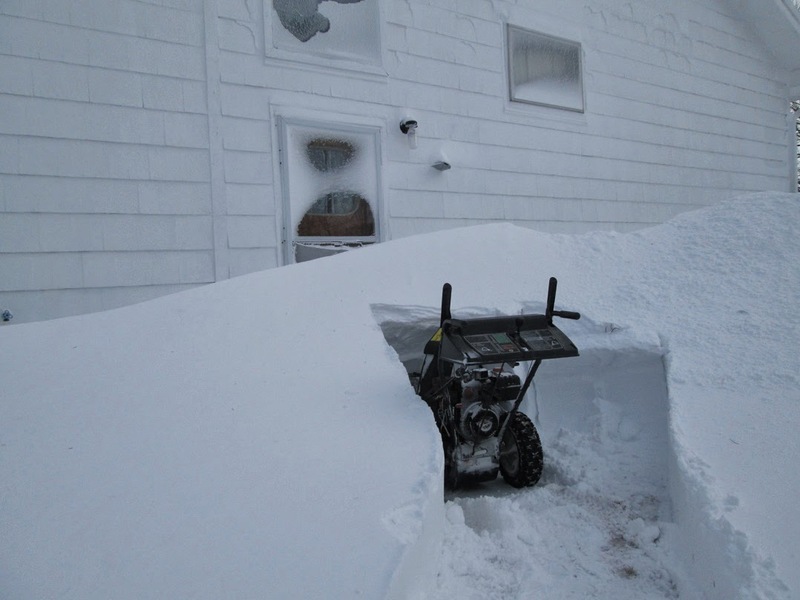 There will take a while to dig out in the morning. 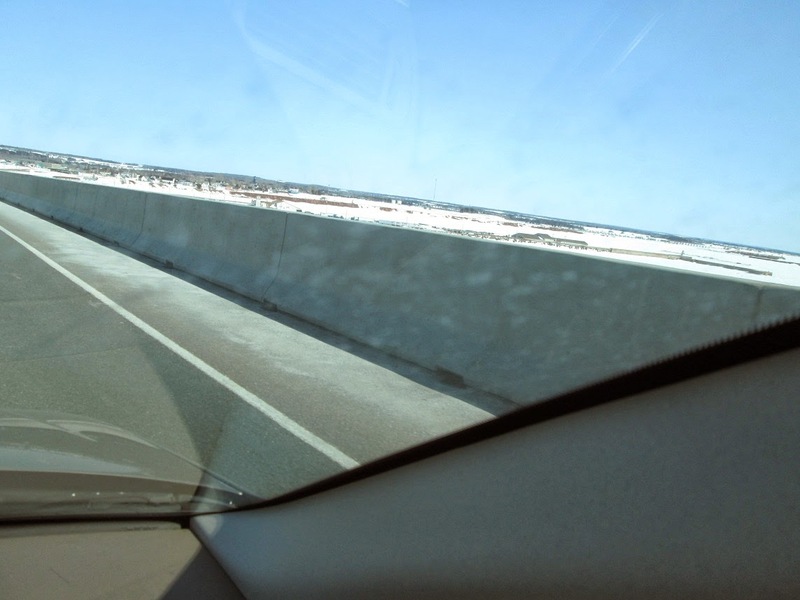 After 25 hours of driving the bridge to PEI is ahead of me. I can see a bit of the red shores of PEI, it is good to be home. 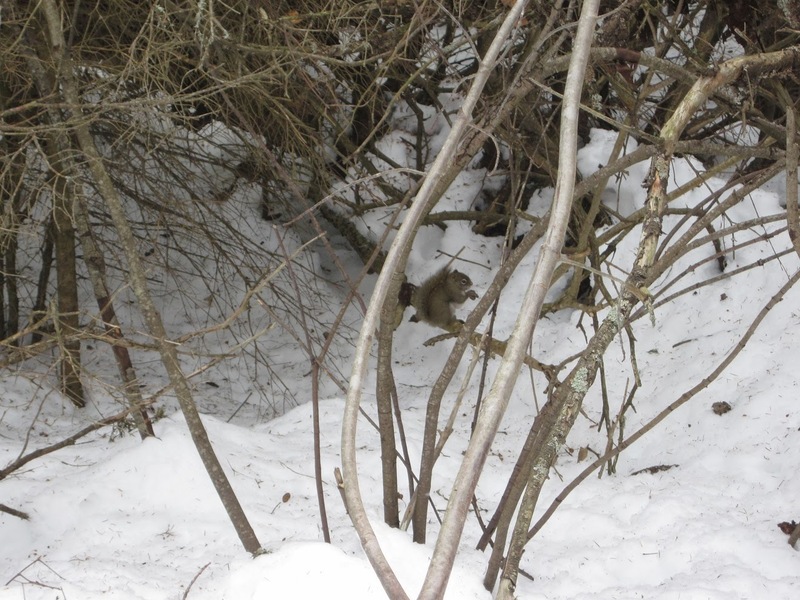 After lunch I went out on the snowshoes for about a hour. 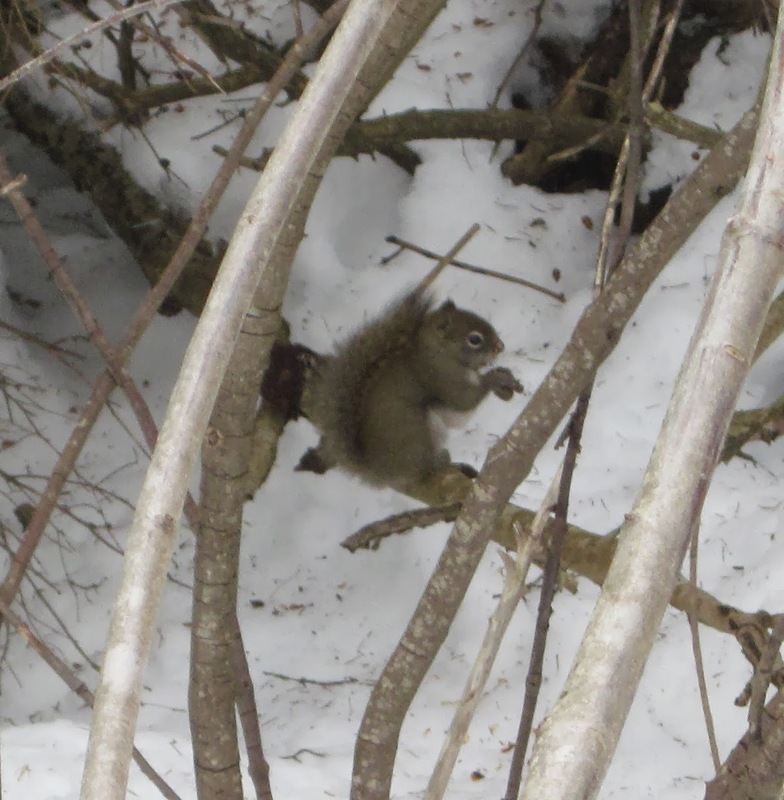 I saw this squirrel in the woods near the business park. They are hard to get a photo, usually they don't stay long enough to get a photo. 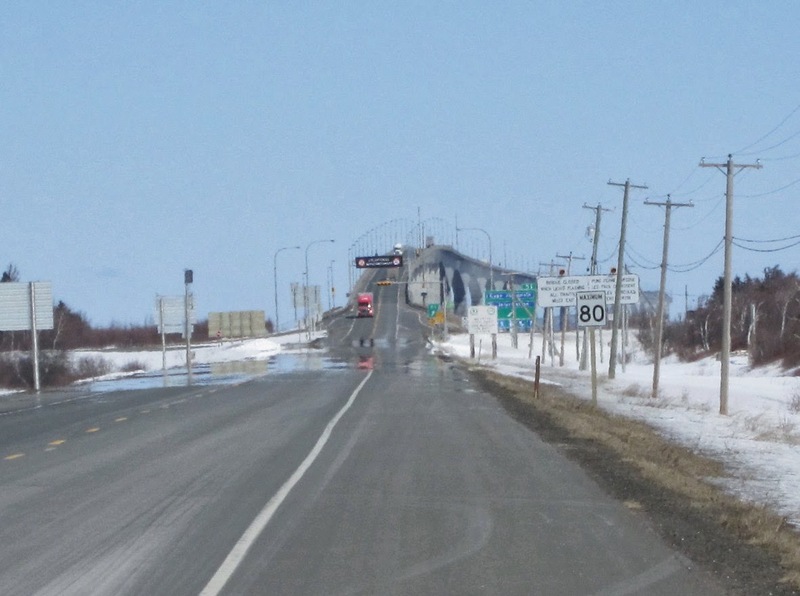 The government sand pile is almost gone, they will need to haul in some more. 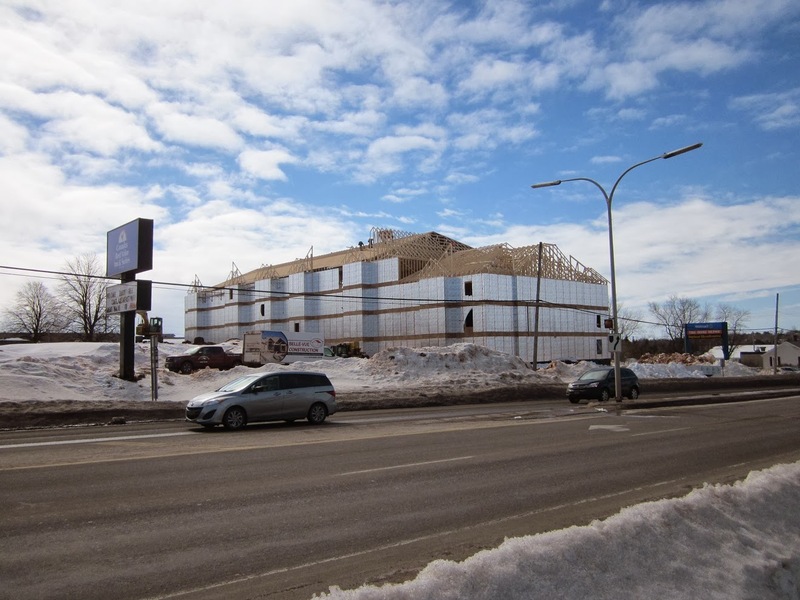 A 40 unit apartment building going up on Capital Drive in Charlottetown. 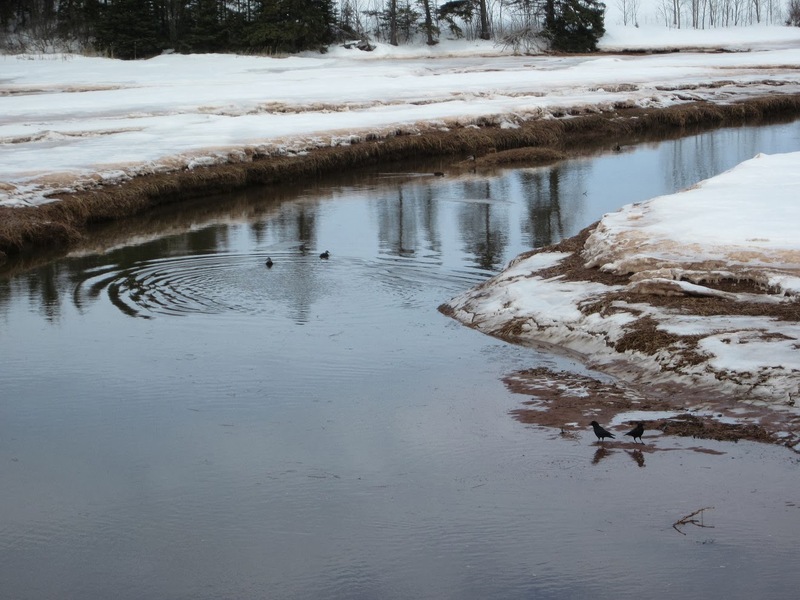 I was out cycling for 90 minutes, I turned at the Clyde River bridge and saw these ducks in the river. 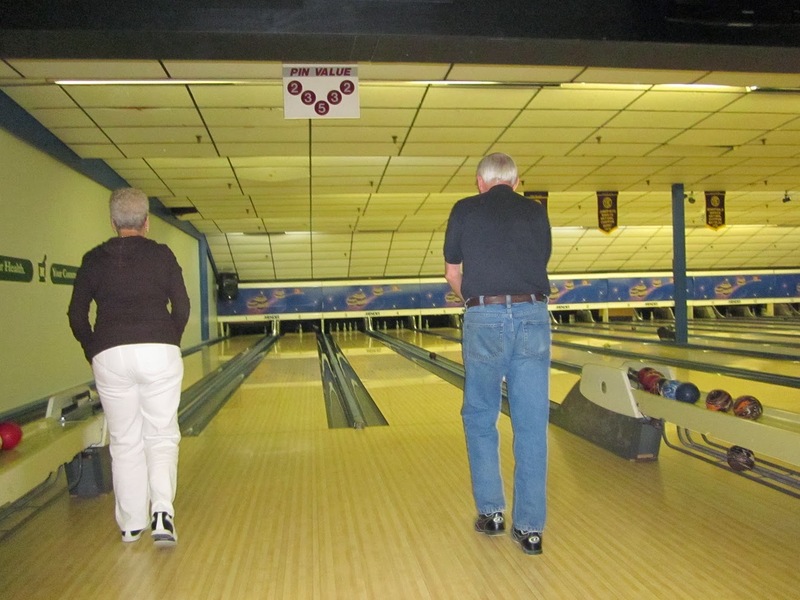 I was bowling in the morning as part of the 55+ games, it has been many years since I have bowled. I sure needed some practice. 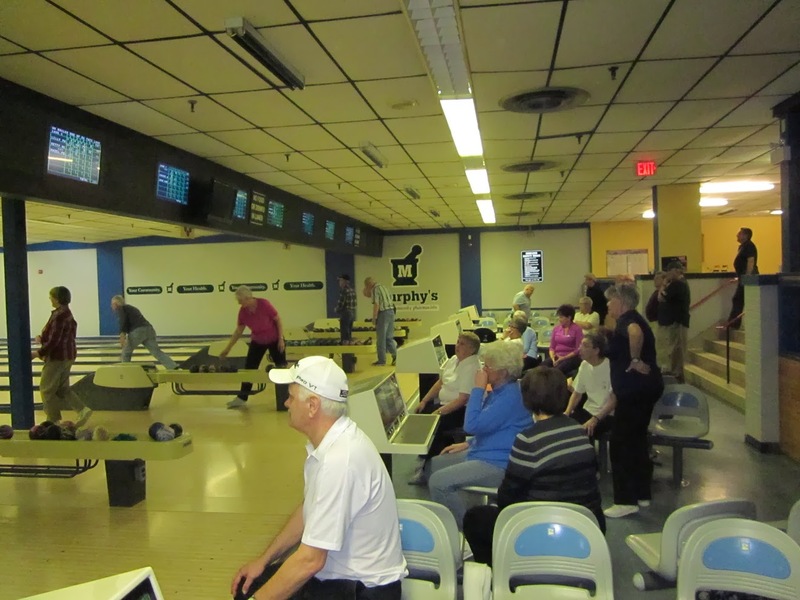 I think all 12 lanes were in use, so a good turn out for the bowling. 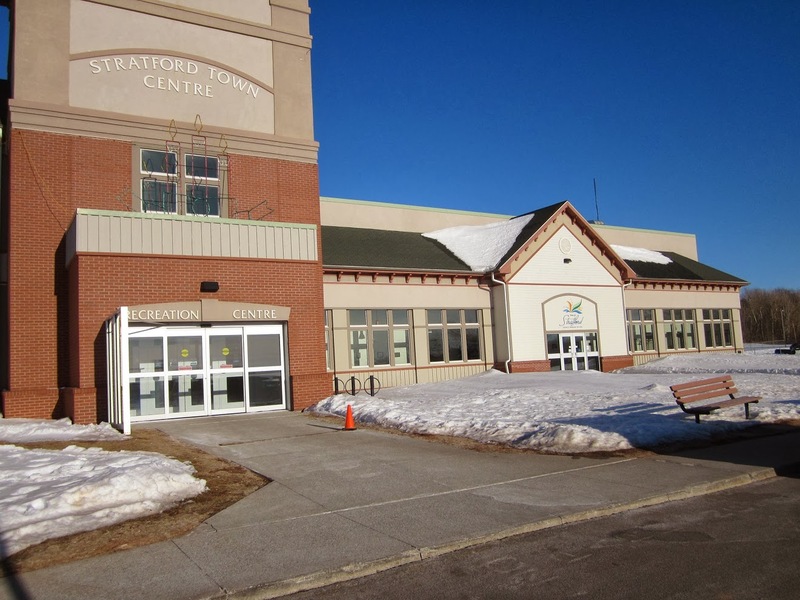 The closing dinner was held at the Stratford Recreation Center. Because the temperature was up to zero, I went cycling between the bowling and going to the closing dinner. I was out on the bike for about 75 minutes, I did the Peter Pan to Cornwall to York Point loop. 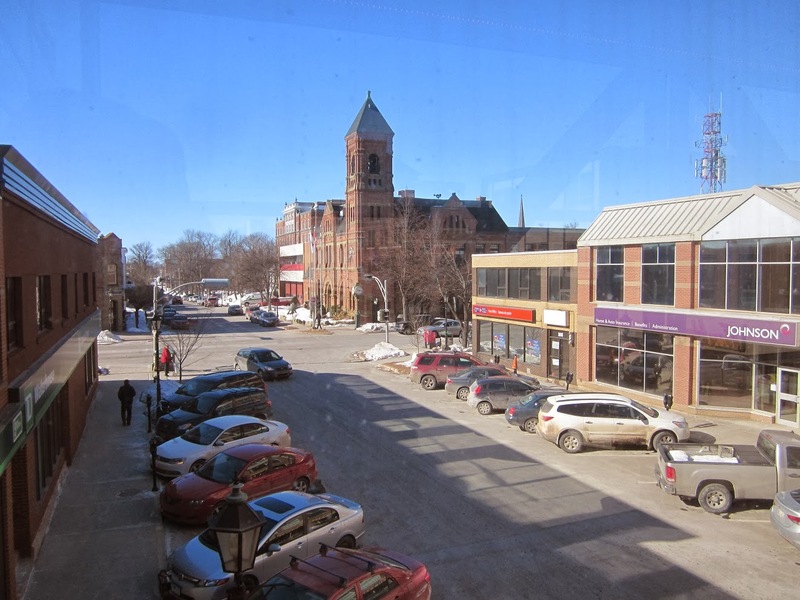 These photo of the Charlottetown hall was taken from the Kent street pedway. 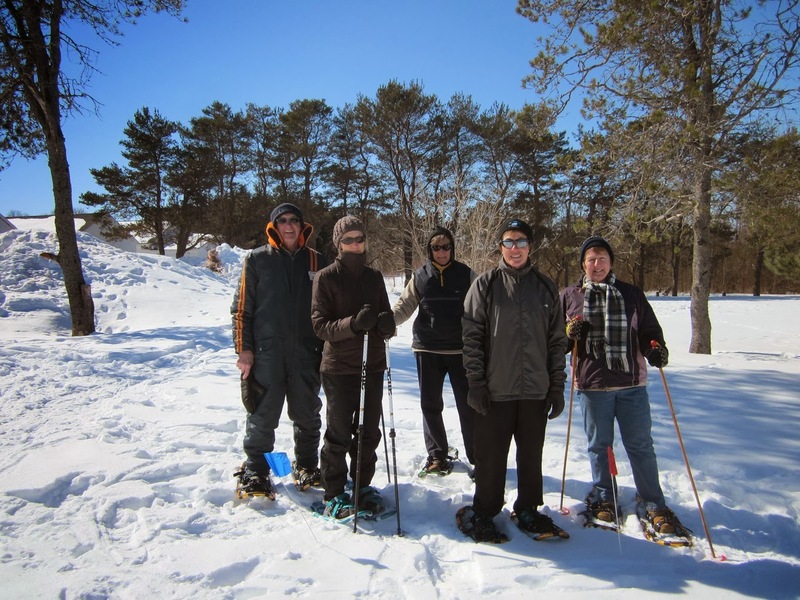 In the afternoon I took part in the snowshoing for the 55+ games that are being hosted in Stratford. No a big turnout, it was sunny but cool, around -10/-12. I was on the river edge when I took this photo across the Hillsborough River looking at the Energy from waste plant. 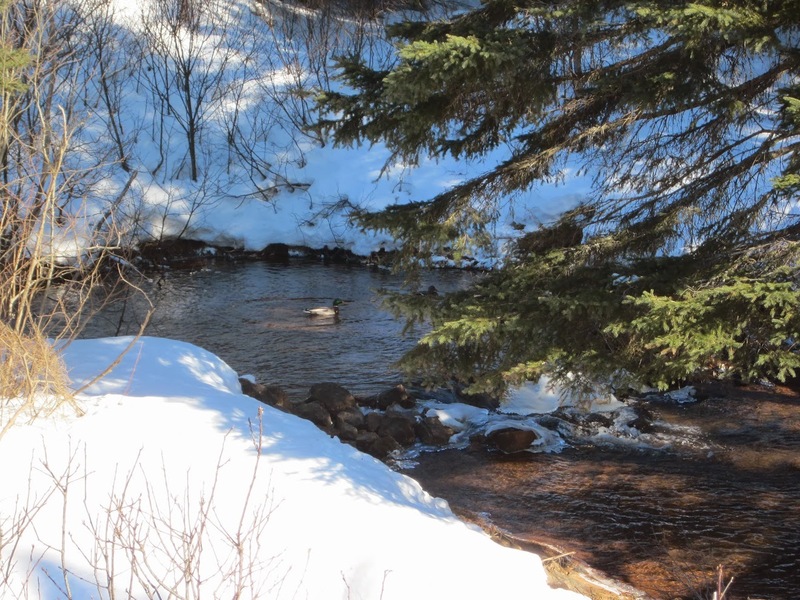 In the afternoon I was walking on the Confederation trail for 75 minutes, Lot of open water in this branch on the North River. I believe it is calls the Coles creek. 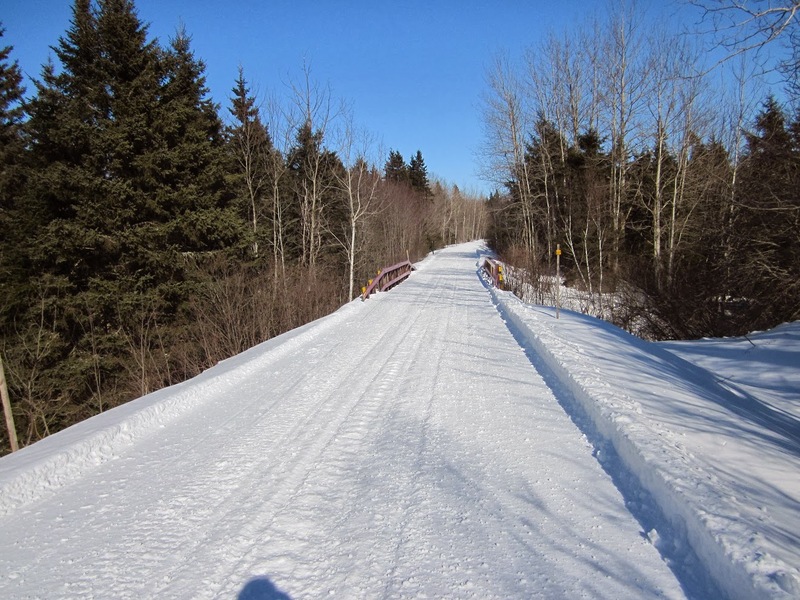 The trail is groomed for the snowmobiles, it is smoother than some of out streets. I was walking in the Milton area. The creek is close to Rte 248 and these two Mallard were ducks in it. 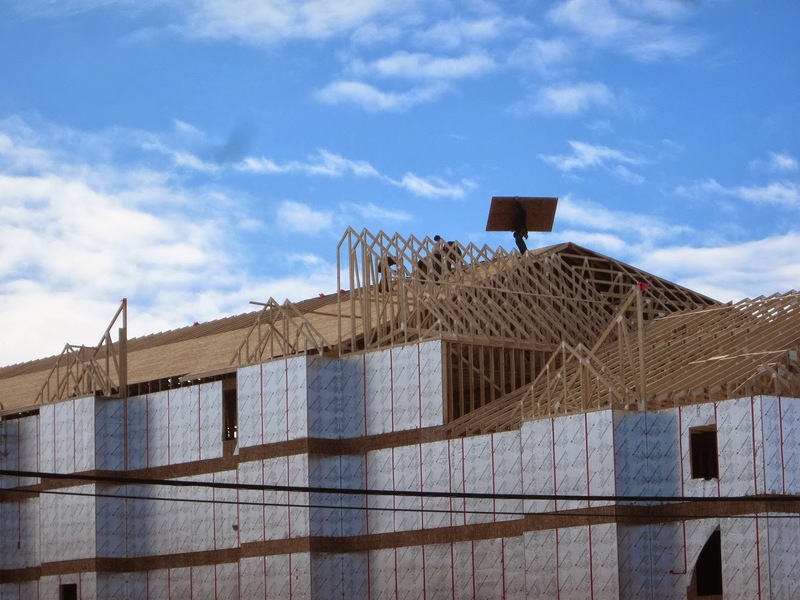 Although it was sunny, it was -12 with a wind chill of - 18. 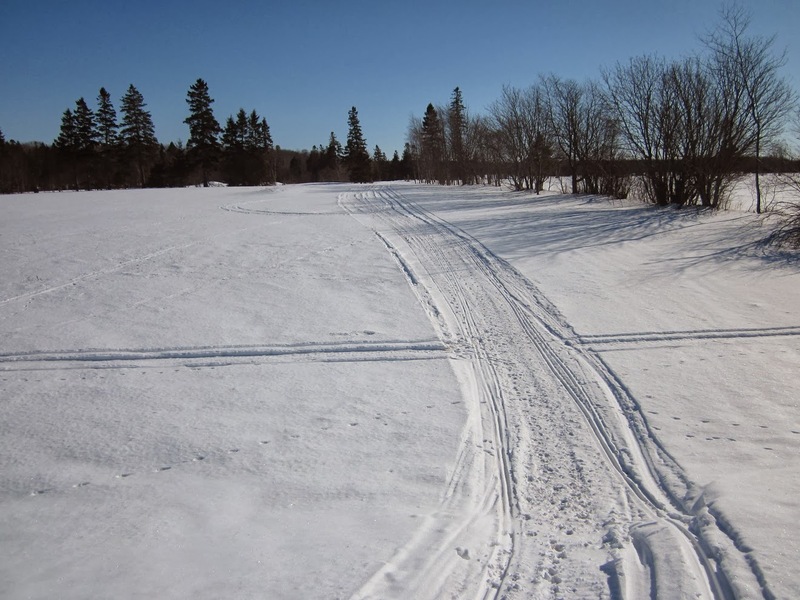 I was walking for 50 minutes and went as far as the business park, it was good walking on the snowmobile tracks without the snowshoes. The gps indicated that I travelled 3.4 km. 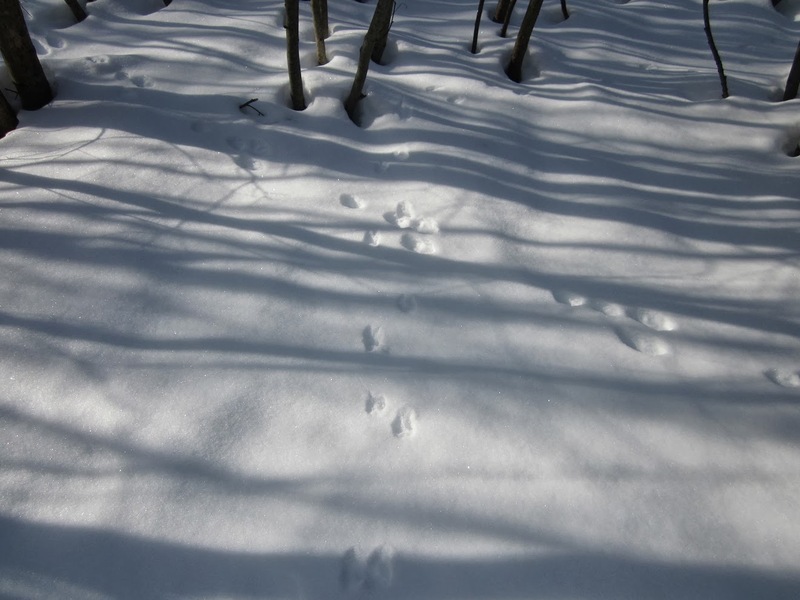 There was lots of fresh coyote tracks, seems like they use this path a lot. 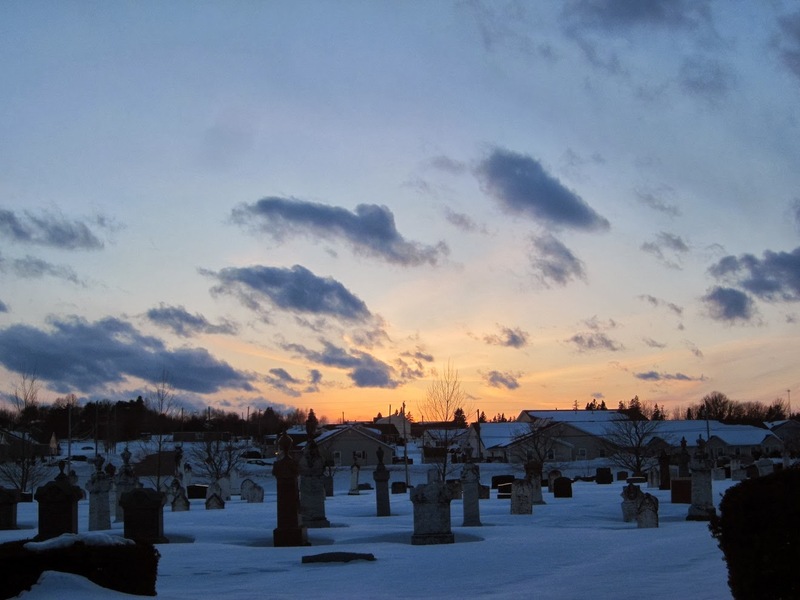 This evening I was to a church pancake supper, this shot of the setting is looking out over the cemetery. It was -10 with enough wind to have a wind chill of -18. 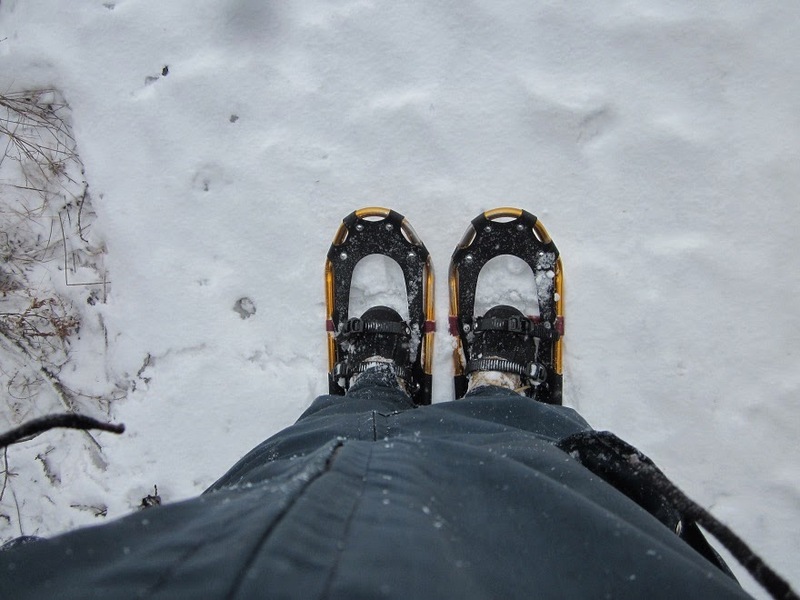 I went for a walk around 3:30, Didn't bother with the snowshoes, trail was firm enough for just using hiking boots. 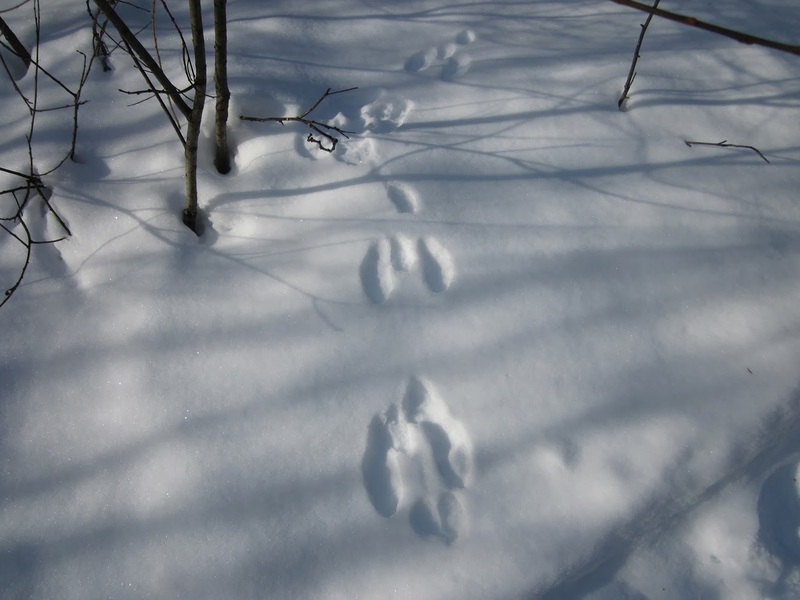 I believe these are rabbit tracks. And a squirrel went by here. 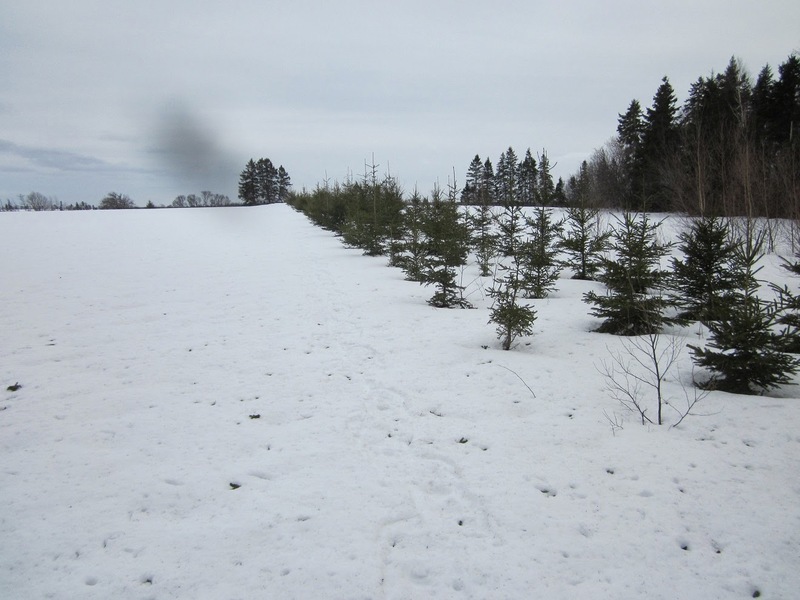 And I am sure there is ski tracks here, mine from yesterday. 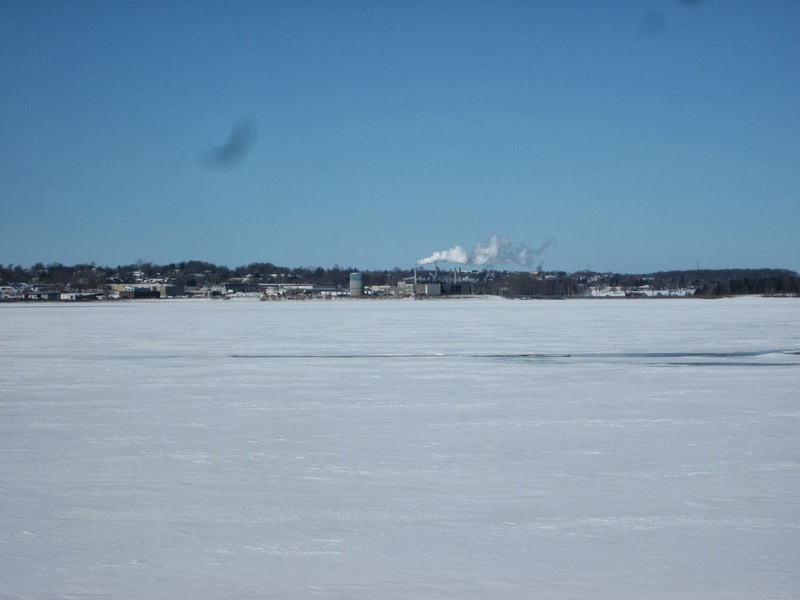 It was a nice clear day at -9 and almost no wind. The setting sun at 6:00 PM, next week it will be after 7:00 before it sets. 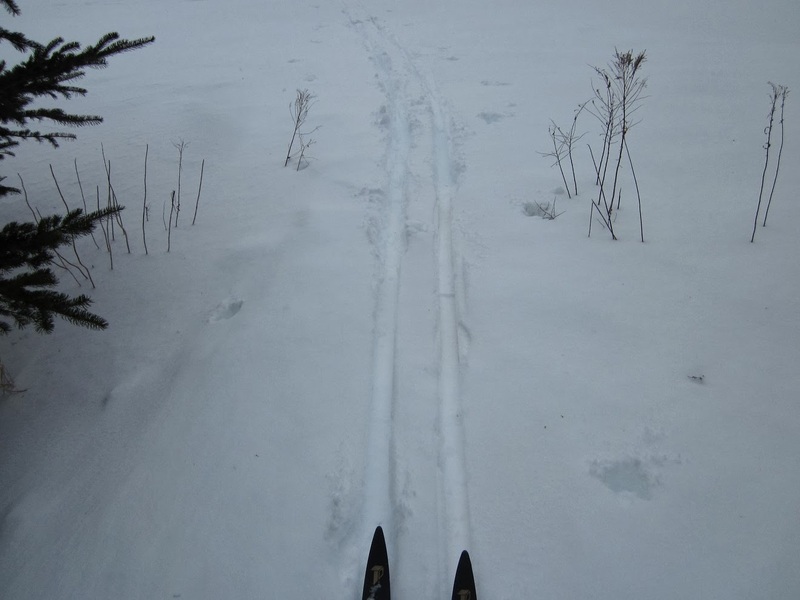 It was back to the skis this afternoon, these tracks are from some out before me. And the he is, we chatted for a few minutes. I was out for 70 minutes and travelled 4 km. At noon time it was +4 but by 6:00 PM it was down to -8, I am watching the men's curling this evening.